Two words keep coming to mind as I study the charts right now: "inconclusive noise." I think it's vitally important as a trader (and probably as a person, too) to "know when you don't know." The near-term possibilities having suddenly spiraled into infinity, so it's going to be difficult to project the market's next move until it gives us a bit more info. If you're a new trader (or a new reader), please don't be discouraged by this; the market alternates between moments of clarity and moments of ambiguity, and it will clarify again soon enough. I studied a number of markets yesterday, and while I'm not going to publish charts on every one of them, there are lots of conflicting signals out there. Some updates leave me feeling that I put in a whole lot of work for a very limited reward (for readers), and this is one of those. I'm inclined to give the bears a near-term edge, but my confidence is low at the moment. I'm going to start off with the Dow Jones Industrials (INDU), since the rectangle pattern here has some fairly clear implications using classic technical analysis. 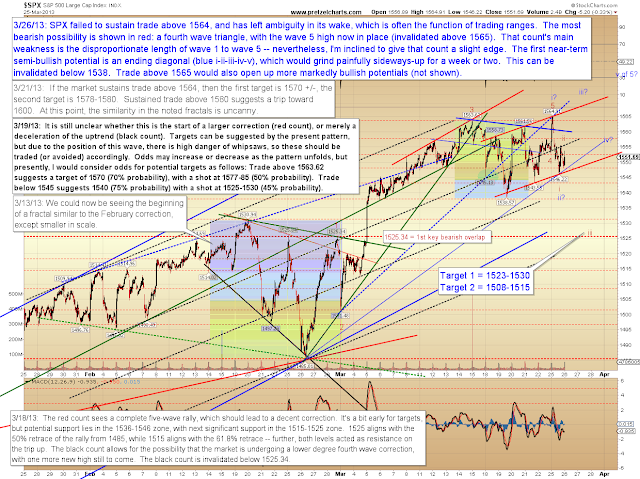 On the SPX 10-minute chart, I've outlined the two near-term bull and bear potentials which presently appear most reasonable, but I have not shown the most bullish of the near-term potentials. I'll outline that potential briefly here in the body of the article (and on the Russell 2000 chart in a moment): It is possible that the rally from 1538 to 1561 is wave i of 5, and the entire move since is a corrective second wave. 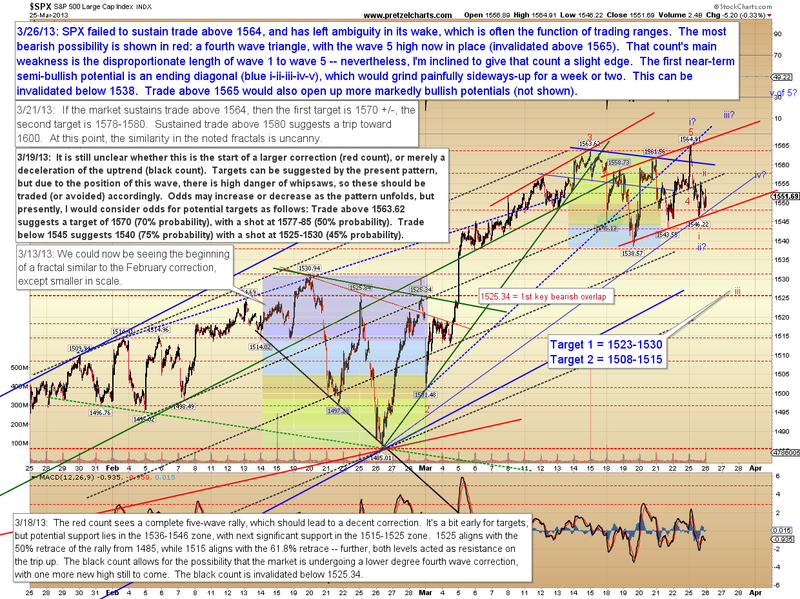 That count suggests a target in the 1580-1600 zone and becomes an option above 1565, while it would be invalidated below 1538. The annotations explain the details of the other two counts. 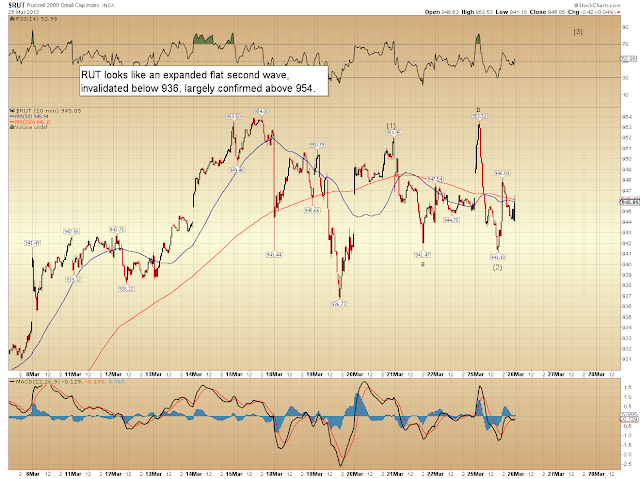 On the hourly chart, I've moved a couple labels, but the conundrum remains the same as it's been. I continue to believe that wave 5 has either completed or will complete with one final leg, at which point we should see a larger turn. I'd like to share one last chart which is presently throwing the near-term bear count into disarray -- and it's one of the reasons I'm not ready to declare a high level of confidence yet. 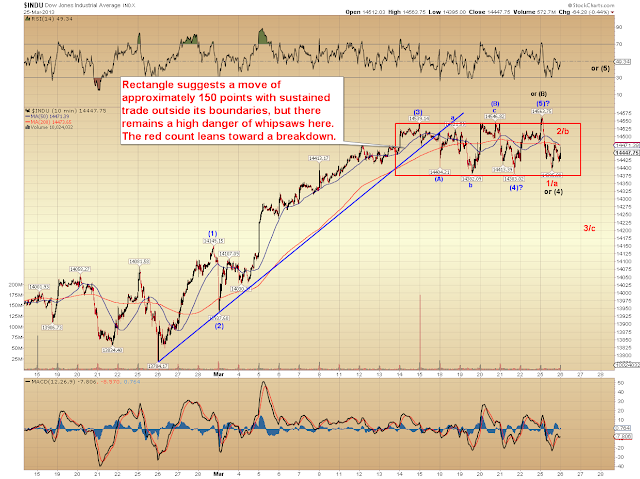 The count shown here is fairly bullish for the near-term, and I have listed the key levels. 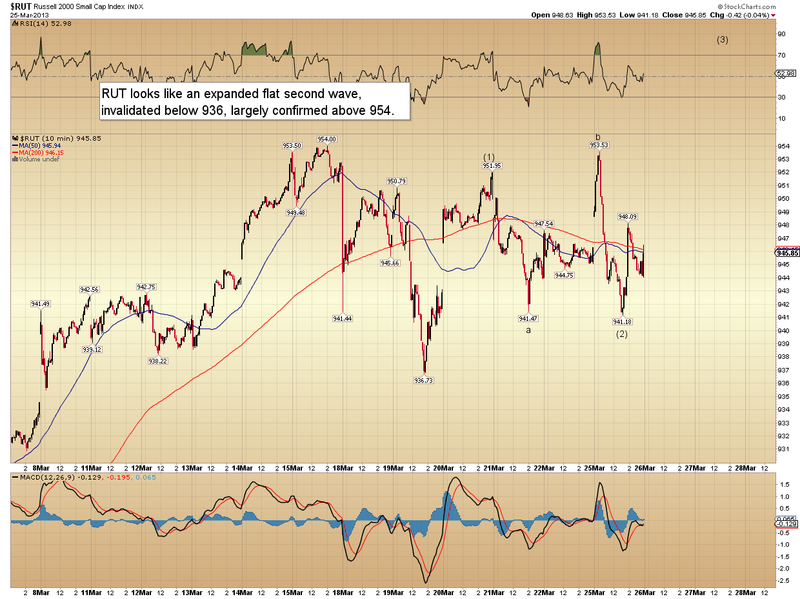 Sustained trade above 954 would suggest a target of 965. 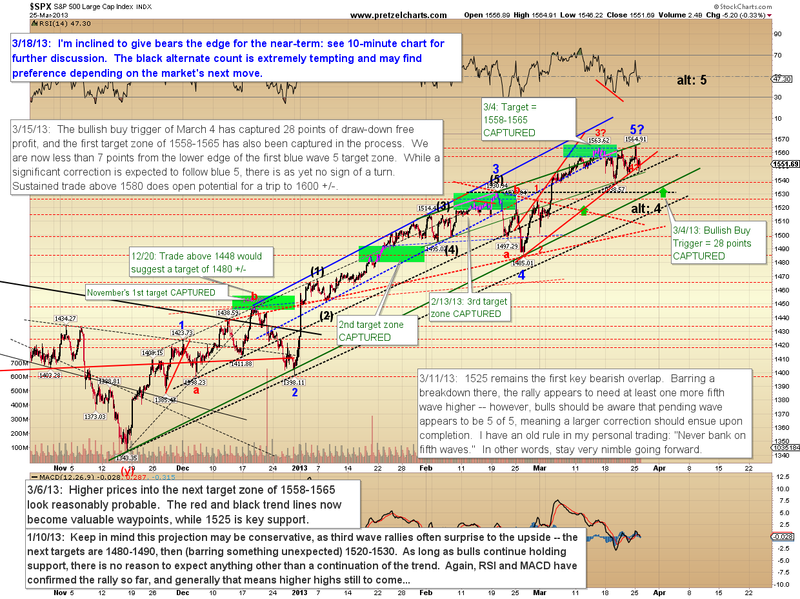 In conclusion, yesterday's market has left the wave counts inconclusive at multiple degrees. This is often the function of trading ranges. The market regularly alternates between moments of clarity and moments of noise -- right now we're still in the "noise zone," and we're simply going to have to be content to watch and wait for the time being. Trade safe. It certainly seems that we are experincing a real "BULL market" considering the economic fundamentals. Wonder where the market would be without help from uncle Ben? Well as they say, don't fight the FED.